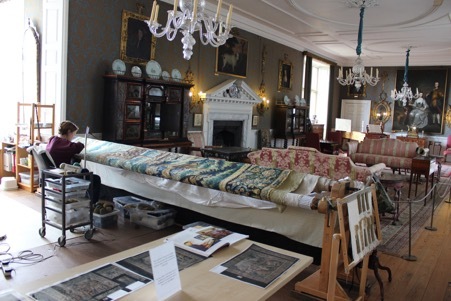 In June of this year we began a pilot project to conserve the first two tapestries from the Yellow bedroom set of tapestries at Doddington Hall. The tapestries were taken down from the Yellow bedroom back in 2014, where they had been hanging for more than 250 years. Like the Holly bedroom tapestries (which have recently completed their conservation journey), they had been nailed to the walls with over 700 metal tacks and brutally cut to fit the room they hung in. They were black with accumulated dirt and soot from their many years on display and in much need of repair. 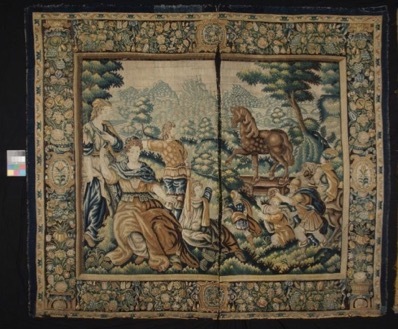 The Yellow bedroom tapestries are believed to depict scenes from the Trojan wars and like the Holly bedroom tapestries are considered lower quality coarse tapestries, which unlike their high quality counterparts have not survived in great numbers so are now considered rare and important. 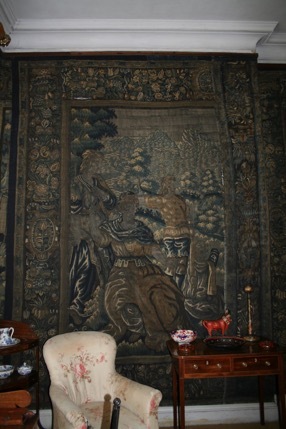 Image 1 – The ‘Seated Lady’ tapestry panel hanging on the wall in the Yellow bedroom before it was taken down in 2014. You can see how black with soot the tapestry was, obscuring the features and details of the figures. Once removed from the walls the tapestries were vacuumed and then travelled to Mechelen in Belgium to the Royal Manufacturer De Wit facility where they were wet cleaned on a large suction table and sprayed using water and detergent. Many of the colours and details of the designs were revealed. (you can read more about removing the tapestries from the walls and the wet cleaning process in two of our previous blogs found here. 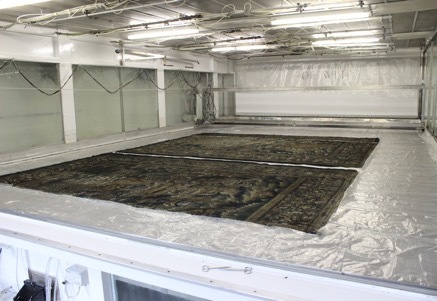 Image 2 – Two of the tapestry panels laid out on the wash table at DeWit awaiting their wash. Thanks to initial funding from The Country Houses Foundation we have been able to complete the 3 month pilot phase of the project. This has involved the completion of the conservation stitching of two of the (nine) tapestry panels, panels we have named ‘The Trojan Horse’ and ‘The Seated Lady’. These two panels were once the same tapestry, at some time in the past it was cut half creating these two separate pieces which now hang on opposite sides of the bedroom. In the following image you can see the two panels laid next to each other after they had been wet cleaned. You can see how the washing process has revealed the detail in ‘The Seated Lady’ when compared with the first image at the start of this blog. Image 3 – The ‘Seated Lady’ and ‘Trojan Horse’ tapestry panels after wet cleaning. The two panels once formed one whole tapestry. The tapestry panels are to be returned to the Yellow bedroom walls in the formation we found them as part of the decorative scheme created by Sir John Delaval back in the 1760s, so we have not sewn the two pieces back together. We hope to have a temporary display of the two panels hanging next to each other in the Yellow bedroom in 2017. The project has been set up in the drawing room of Doddington Hall where on open days to the house you can find our two large wooden tapestry frames and three full time conservators working on the project. The Drawing room is a lovely space to work surrounded by all the historic objects and furnishings and the many portraits of the Delaval family. Image 4 – One of the tapestry frames in view within the Blue drawing room of Doddington Hall. The project has recently secured funding from the Heritage Lottery fund to support the ongoing conservation work on the Yellow bedroom tapestries and to provide opportunities for a tapestry conservation intern and shorter student placements to gain experience in tapestry conservation. The project aims to be completed by May 2018 with all the tapestries conserved and returned to the Yellow bedroom for all to enjoy. For images and weekly updates on the conservation project, follow us on Instagram at conservation_at_doddington.